On Friday morning, February 1st , snow and single digit temperatures made for very poor driving conditions on area roadways. Lancaster and Chester County Fire communications were very busy dispatching multiple vehicle accidents thru out both counties. 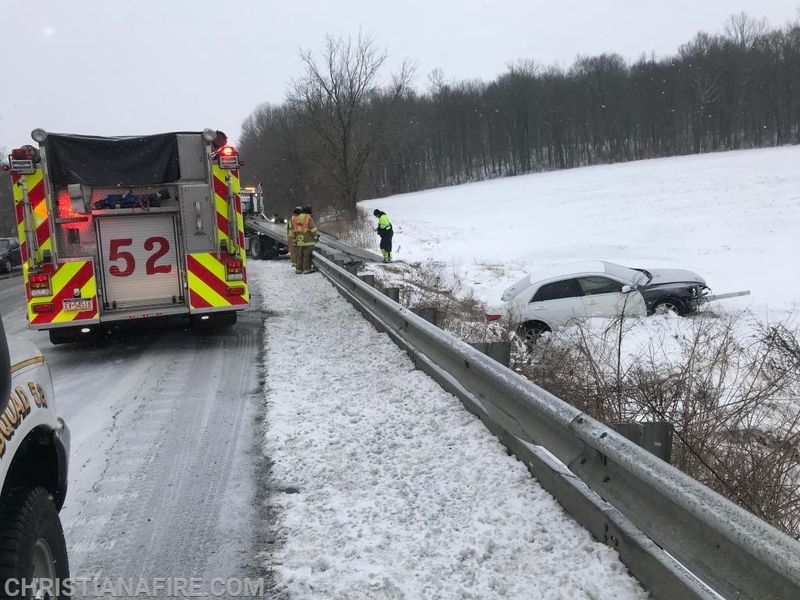 At 08:30 AM, 52 Station volunteers were diapatched to the intersection of Route 41 & Lower Valley Road for a reported vehicle down an embankment with unknown injury. Engine 521 ( Capt. Swift ) and Squad 52 ( Asst. Chief Reimold ) responded within minutes. Arriving in the area, the crash was found to be south of the intersection just into West Fallowfield Township. Two patients were treated and transported to Lancaster General Hospital by Ambulance 46 ( Christiana ) while the 52 crew handled debris cleanup and depowered the vehicle. The incident was complete at 09:13 AM with 8 members responding.